Nukus – capital of Karakalpakstan – a new, modern city, founded in 1932. It is located near the Aral sea, surrounded by three deserts – the Karakum (Black sand), the Kyzylkum (Red sand) and rocky desert – plateau Ustyurt, and the fourth desert Aralkum or Akkum (White sand, as a result of the drying up salty Aral) joined to them. The history of Nukus begins not from the obtaining the status of the capital of Karakalpakstan, but from the origin of the human settlement on the occupied territory. The settlement did not disappear, but then it was developing as the urban-type settlement. Time and circumstances of the origin of such urban-type settlement is of significant interest as the first page of the city history. Nukus passed through such “pre urban” stage of its history. 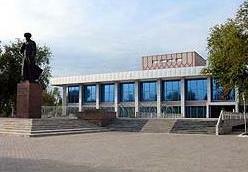 There are no historical and architectural monuments in it, and the main place of interest is Karakalpak State Art Museum named after I.Savitcky. 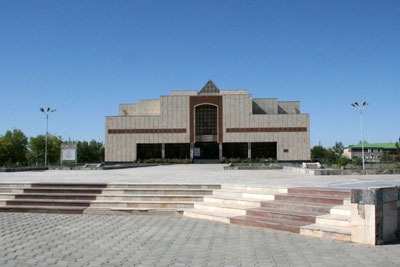 The fame of this "museum in the desert," as it was named by the leading art critics and experts of the world went beyond the bounds of Usbekistan, its collection is so unique and original. The founder and the first director of the Museum Igor Vitalevich Savitsky was studying at the Moscow Art Institute named after V. Surikov, when he was evacuated to Central Asia during the World War II. The acquaintance with the amazing history and ancient culture of the Karakalpak became the incitement to ethnography and archeology, and Karakalpakstan became his second home. The museum was founded in 1966 and originally its collection was cooped up in seven small rooms, and in twenty years a special building was constructed. The museum exposition consists of three sections. They are: ancient and medieval art devoted to the culture of old Khorezm, on the lands of which Karakalpakstan is situated; folk art and decorative and applied arts; and fine art. There are archeological finds in the expositions, telling about the history of old Khorezm – motherland of “Avesta”; trade relations of the Khorezms with the ancient world; unique terra-cotta statuettes of Zoroastrian goddess of fertility – Anahita; vessels for keeping remains of fire worshippers’ dead ancestors; ceramic and bronze products. There is also the State Museum in Nukus, in which archeological finds and endangered species of flora and fauna of the Aral Sea are presented. Both museums demonstrate the rich past of the city.